This is an Expert Advisor for effective management of investments, making a large number of medium-term trades. The strategy uses only price action and timing. The EA monitors and accumulates statistics of the price action, rate of tick changes, and makes trades depending on how the price has changed on a given period. The EA works with market orders in two directions simultaneously. It uses a self-adjusting algorithm for closing trades, which is based on tick data. The EA has functions for working by time. It is possible to set the operation time for a specific trading session only, or vice versa, disable operation during the specified trading session. During the unauthorized time for trading, the EA will not open new orders, but will manage opened ones. Also, if the total profit of all trades on a symbol is greater than 0, the EA closes all open positions. VPS is recommended. The recommended minimum deposit per 0.01 lot is 1000 units of the base currency. The EA is to be used on highly liquid currency pairs with a small spread/commission (for example, EURUSD, GBPUSD, AUDUSD, USDJPY, USDCHF, USDCAD, NZDUSD). 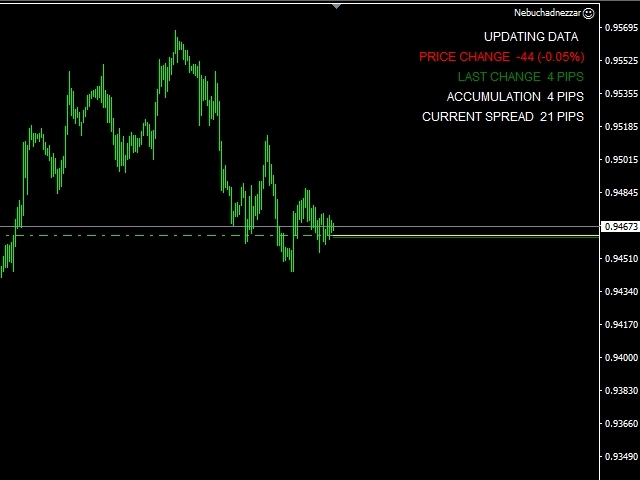 Chart timeframe does not matter, the working timeframe is defined in the EA settings. UpdateData - the number of seconds, used in the block for updating the data. Start 5 / step 5 / stop 30. Accumulation - accumulation of ticks, used in the block for opening orders. Start 50 / step 10 / stop 100. TimeFrame - the period for calculating the price change. Set at your discretion, default is M1. Distribution - distribution of trades, used in the block for opening orders. Start 0.1 / step 0.1 / stop 2.0. Increase - increase in the number of ticks, used in the block for closing orders. Start 0.2 / step 0.2 / stop 2.0. StartTime, EndTime - operation by time; 00:00 - not used. MaxSpread - the maximum spread for opening trades. LotsFor1000 - lot size per 1000 units of base currency. MagicNumber - a unique magic number. This EA is designed for long-term use, therefore, do not expect immediate results. There can be unprofitable days, weeks and even months. The number of trades mainly depends on the market volatility. Keep in mind that this is only a program and not a Grail. Only you should decide when and where to use it. Before purchasing, please test the EA in the strategy tester.